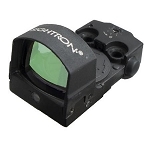 The Sightron S30-5 ESD offers a 5 MOA reticle with a 30mm tube. It is an ideal red dot sight for shotguns, rifles, magnum pistols and bows to cover all shooting situations. This sight comes in black matte and features an 11 position rheostat. This feature provides illumination settings for all lighting conditions. The higher settings are for use on bright days when contrast can be low and the lower settings provide a dimmer light when shooting in low light conditions or dark backgrounds are the target of choice. This sighting device is ideal where mounting requirements favor the 30mm tube for use with third party rings and bases. It is waterproof, fogproof and nitrogen filled.